YouTube has expanded the width of the screen page to 960 pixels to better reflect the quality of the videos being uploaded and the screens being used to watch them. The news was announced on the YouTube blog on November 24. As with any transition in production and reproduction standards, there are people unhappy with the changes. Earlier videos, uploaded in 4:3 aspect ratio, now appear with black bars on the side, just like they would on a wide screen television. 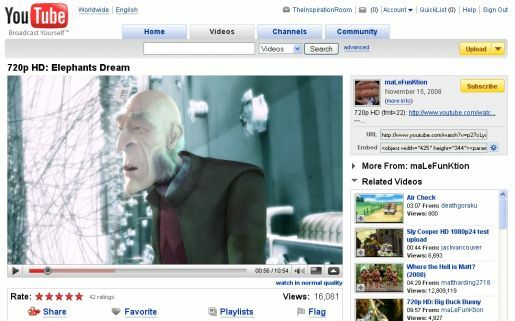 YouTube has also added the capacity to upload and show DVD quality videos, in stereo with 1280x720p resolution. Just add “&fmt=22” to the end of the address to access the higher quality HD version. The move to allow HD reproduction was helpful. Moving towards 720 dpi will ensure that YouTube continues to compete with other popular channels such as Vimeo, Dailymotion and Hulu. From the perspective of The Inspiration Room, these are steps in the right direction. We use Smart YouTube, a WordPress plugin, to embed YouTube videos in each post for The Inspiration Room Daily and in the Daily email. YouTube was chosen as the preferred provider, not because of the quality of presentation, but because it’s the only way we can be sure that mobile phone users, in particular iPhone users, are able to access content. It’s good now to have more chance of high quality presentations. Try the new resolution out here with Elephant’s Dream, from Project Orange. Be warned though. It’s a 10:54 minute video. It will take some time to load and play. To play in full screen, click on the second button from the right at the bottom of the YouTube screen. Thanks to Vladimir Prelovac for the tip.